Whole Goji Extract Naturally Standardized to 40% Lycium Barbarum Polysaccharides (LBP). Goji fruit, from the plant Lycium barbarum, is revered in Asia for its youth preserving, health protective, strengthening, and mood-supporting properties. It is one of the main herbs used in China's amazing herbal system and is regarded as one of the elite tonic herbs in the world. The incredible efficiency of the antioxidants in Goji LBP-40 makes it a perfect tonic herbal supplement. Goji LBP-40 is naturally standardized to contain 40% Lycium Barbarum Polysaccharides, or LBP. Lbp is a constituent unique to goji berries. Lbp has been demonstrated to support stamina. Lbp Supports immune functions, skin and normal healthy dna activity. Lbp supports our innate antioxidant system by supporting sod (superoxide dismutase) production and activity. Sod has been dubbed the "youth enzyme." Sod protects our cells (including the cells of the brain, heart, kidneys, liver and other organs) from the ravages of internally-generated free radical accumulations from normal living. As we age, the innate sod system gradually weakens and requires dietary support to remain effective. Goji LBP-40 is a full spectrum Goji berry extract, with every component of the world's greatest superfood present. Consuming this herbal extract is equivalent to eating the fresh berries every day. The convenience of taking this herb in capsule form makes it an important addition to the tonic herb shelf in your home. In addition, the high concentration of lbp assures unsurpassed, powerful immunological and antioxidant protection. Dragon herbs goji lbp-40 is a natural powdered extract of the highest grade lycium barbarum fruit containing a minimum of 40% lbp (lycium barbarum polysaccharides), the optimum extraction ratio for this herb (a higher extraction ratio has been shown to reduce the efficacy of the product). This pure extract maintains all the constituents and activity of fresh goji berries with the added power of full lbp extraction. Goji LBP-40 contains all five known LBPs, carotenoids (zeaxanthin and beta-carotene), flavonoids, a vitamin C precursor that converts to vitamin C once it is absorbed into the blood stream, and zinc. Ingredients:Lycium Barbarum (Goji Berry) powdered extract standardized to contain 40% Lycium Barbarum Polysaccharides (LBP). 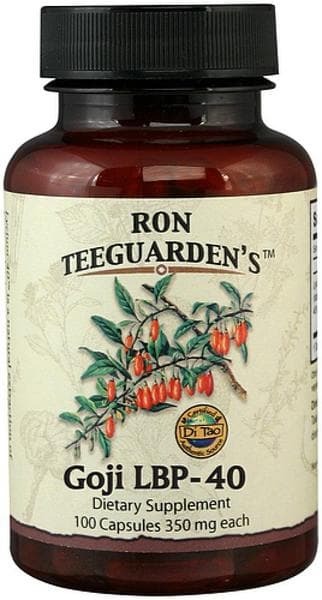 Lycium barbarum (goji berry) powdered extract standardized to contain 40% lycium barbarum polysaccharides (lbp). 100 capsules 350 mg each.